For St Patrick’s Day enjoy this Gluten Free Dish. 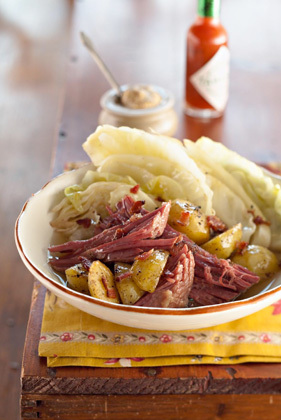 Now we prefer our Corned Beef and Cabbage with mashed potatoes, a little garlic cloves and hot sauce. Of course you add bacon to it and that makes it Southern Style! You can if you prefer, cook your corned beef in the crock pot but the recipe gives instructions for dutch oven. Gluten Free can be EASY and GOOD!